© Allied Filmmakers N.V. © 1993 Nintendo. All Rights Reserved. 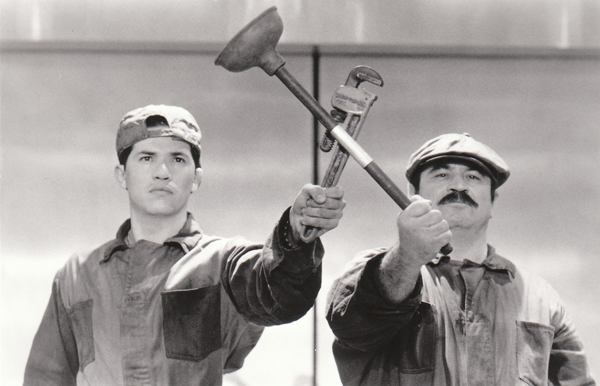 Caption: MERIE W. WALLACE / John Leguizamo (left) and Bob Hoskins star as two plumbers who are pulled into another dimension and must stop the evil King Koopa from merging his world with ours in "Super Mario Bros."
Let's make a deal. I'll go on one of those centrifugal-force rides, the kind where the bottom drops out and you're pinned against the frame of a whirling metal cage, for 97 minutes. You attend "Super Mario Bros." Then we'll see who has the blurriest vision and the loudest ringing in his ears. Bombs explode, cars careen and crash, people leap from dimension to dimension in this blaring, glaring picture, based very loosely on the famous video game. Kids might get a charge out of the mayhem. I got the vapors. Directors Rocky Morton and Annabel Jankel became famous directing music videos and commercials, then created the satiric TV character Max Headroom. Except for the 1988 movie "D.O.A.," a pleasantly mundane blip in an exotic co-career, theirs have been tales full of sound and fury. This is the apex of their crazy craft. The relatively brief, sane part of the picture is set in Brooklyn, where an archaeological student named Daisy (Samantha Mathis) has been leading a dig to recover dinosaur fossils. She's looking for iridium, an element that would prove dinosaurs were made extinct 65 million years ago when a huge meteor struck the Earth. She doesn't realize that this mega-meteor split the universe into two dimensions: ours and one ruled ever since by King Koopa (Dennis Hopper), who has evolved from Tyrannosaurus to tyrant. Koopa, now almost human, wants to merge the two dimensions, slip into this one and take revenge on all the mammals who have had it easy since the Cretaceous era. To do that, he must recover the meteorite chip around Daisy's neck. But here come the Mario Brothers, Luigi (John Leguizamo) and Mario (Bob Hoskins). The former has a crush on Daisy, so both follow her into the other dimension to battle Koopa and wicked Princess Lena (Fiona Shaw). The Marios are chased by Koopa's moronic minions, Iggy (Fisher Stevens) and Spike (Richard Edson). Morton and Jankel are like plate-spinners whose goal is to get as many plates rotating as possible; whether they drop off the pikes and shatter makes no difference to them. So they break their own science-fiction rules, forget about characters midway through and neglect to explain plot points. They rely on Christopher Woods' visual effects and David Snyder's production design to carry the day. Both are good: Woods' trick of dissolving characters and reforming them across the dimensional barrier never fails to dazzle, and Koopa's chattering pet dinosaur is a charmer. Leguizamo, whose finest work has been done in one-man shows for HBO, pairs appealingly with Mathis. Hoskins does his "Roger Rabbit" splutter. Hopper doesn't seem dangerous enough - who'd have thought that would be possible? - and Stevens and Edson are as funny as the team of poison ivy and poison sumac. Two other things worth noting: Charlotte radio gadfly Robert D. Raiford has a cameo as the host of a sensationalizing TV show. He has a hundred times more dignity than the movie, which ends with the most shameless lead-in to a sequel that I have ever seen. Heaven forfend we should encourage one. Stars: Bob Hoskins, John Leguizamo, Dennis Hopper. Director: Rocky Morton, Annabel Jankel. Note: This article also ran (with slightly shorter text) in the the Albany, NY Times Union under the alternate headline of ''SUPER MARIO BROS.' LOUD, BUT FILM'S JUST A BOMB'. It can be read here.